And finally I have a team to support in the next World Cup. Today it was off to Strathpeffer for a community day out. We always wonder if these days are worth the effort and a day off work but this one was ok. There were several people we know who were there, agency employees and other community councillors. The subject was how to spend the money that was accruing to communities through mainly outside developed wind farms. This was not directly connected to Applecross as we are developing our own and it is hydro. It nevertheless interesting to see how other communities deal with the large amounts of money now coming in to fairly small population centres. A purely personal observation but I only found one speaker inspiring, an employee form CES who worked up in Orkney who stated the community owned facilities had more worth to the communities involved as they had put all the effort into building it and thus had more pride in the results. Also the money earned would be put to good use as it had been hard-earned. Although there is nothing wrong in developer money going into affected communities for me it would not have the same meaning. Maybe this is just splitting hairs. These events are great for meeting new people of similar minds, guys who are positive, who faced with problems try to fix them and warn other people about the mistakes they have made. There is a genuine network out there which helps communities to help each other and avoid each others mistakes. Only down side of the day was we ran out of petrol yesterday evening. I was hoping the delivery would have come in on the Tuesday but it was not to be. Even worse was the news today the delivery did not turn up due to a brake down on the way over. It bothers me that it was avoidable in that I should have ordered fuel a couple of days before I did, but as they say in France “c’est la Vie”. On the way in to Strathpeffer we talked about Applecross especially as we had a Board meeting last night and all our problems and possible solutions were fresh in our heads. All the agenda items of Hydro,grant applications,broadband provision, elderly care/support worker, work units all have employment prospects but all have one serious problem for us to overcome and that is one of access to land and in particular affordable housing.It came up later in the day but enterprise is one of the solutions to places like Applecross. Until there is a solution to this problem then it is going to be an uphill struggle, not insurmountable but harder than need be to sustainably develop our community.Thinking out of the box and using enterprise I think is definitely the way ahead for places like Applecross to survive and even better thrive. There are a lot of interested visitors at the Inn wanting to know how the community functions out with the obvious tourist industry. I often have a chat with some one about the fishery or the community work going on and later in the evening some one else brings it up saying they overheard what I was saying and lots more questions are asked. I find it great that so many people want to know more than the superficial. Coming back to work at the Inn after a positive day away you cannot help but be in good form, front of house is easy on nights like these. You hopefully entertain the customers as well as giving them some sort of insight into the way you live. It was a gentle service this evening so it was good to speak to everyone, the German bikers, the French couple, the Wiltshire business travel agent and our first Malaysian of the year. They just keep coming. 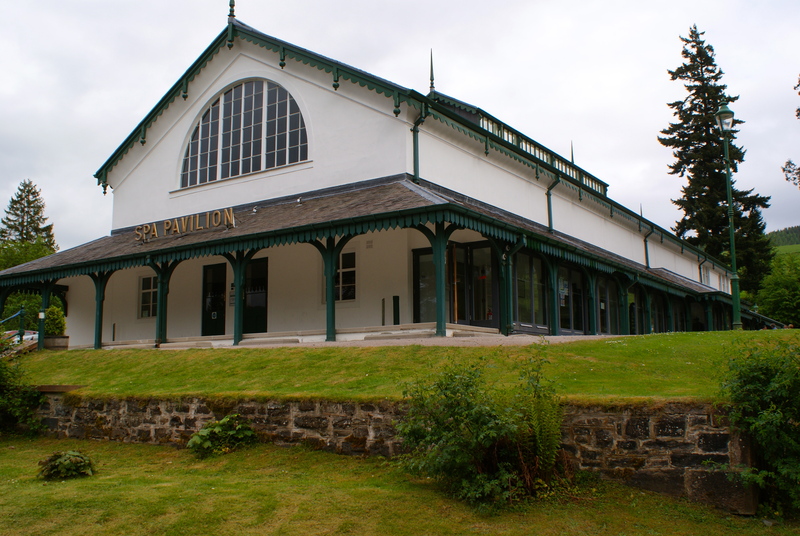 Todays venue took place in the beautifully refurbished Spa Pavilion. It was good to meet up with the Strathpeffer ladies who are on the Social Enterprise course as well as James who was facilitating the event.